"Easy spaghetti dish with a little twist!" Preheat oven to 350 degrees F (175 degrees C). Grease a deep 9x13 inch baking dish. Bring a large pot of salted water to a boil over high heat. Stir in the spaghetti. Boil the pasta until cooked through but still firm to the bite, 8 to 10 minutes. Drain well. Brown ground beef and onion in a large skillet over high heat; drain fat. 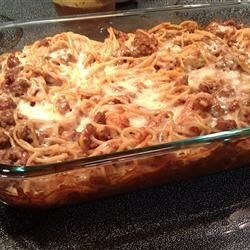 Stir in the spaghetti sauce, sour cream, and 1 cup of the mozzarella. Mix in the cooked pasta. Transfer pasta mixture to prepared baking dish. Top with remaining 1 cup of mozzarella and the Parmesan cheese. Cover pan with aluminum foil. Bake in preheated oven until hot and bubbly, about 30 minutes. My family loved this recipe. It was even better the next day! The only thing I changed is that I used 1 lb of hamburger and 1 lb of sweet Italian sausage. I'll definitely make this again. Excellent, didn't change a thing and it was very good, will save this one. It's easy, it makes a lot, and it freezes well. I make the whole recipe and either divide it into 2 9x11 casseroles, or 4 8x8. I then freeze some to give to friends or have on hand for later! It was so good! Altho, I halved the recipe in half, and only did 3/4 cup sour cream. It was really good, I served it with bread and butter. This was good. My son said he liked it better than regular spaghetti. Its really rich. I cut the recipe in half (we are a family of 6) and still had leftovers. I would make again.